Celebrate your birthday at Skirmish Paintball! 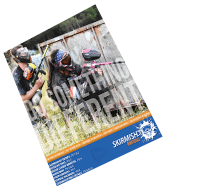 Have a paintball birthday party at Skirmish Paintball! Put down your video game controller and celebrate your birthday outdoors. This is your chance to get out of the virtual reality world and play with on real game maps. You’ll love it and your friends will be talking about YOUR paintball birthday party for months! Plus, we make it really easy for Mom and Dad to make reservations. They just have to give us a call at 1-800-SKIRMISH (1-800-754-7647) and we’ll take care of all of the birthday party details. They can even download your Skirmish Birthday Invitations to give to your friends! Birthday Person plays for FREE! 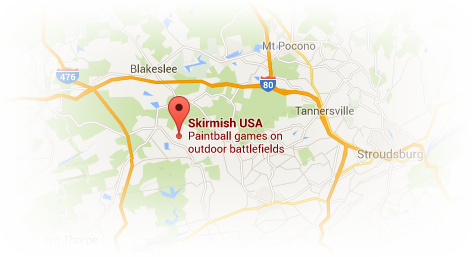 Please call 1-800-SKIRMISH (1-800-754-7647) to book your Skirmish Paintball Birthday Party. A Skirmish Paintball birthday party is for players between the ages of 10 and 17. Adults are permitted to play HOWEVER, the birthday person and majority of the players in your group MUST be between the ages of 10 and 17 years old. We do have adult paintball birthday parties, click here for those details. Minimum of 10 paintball players required for a Skirmish Paintball birthday party. You MUST pre-register to have a youth paintball birthday party. Those that register game day can still play but will not receive the discounted rate or paintball party benefits!